This February, as the country celebrates Black History Month, one significant anniversary of the African-American experience has been largely overlooked. Four centuries ago, in 1619, the first Africans arrived in what would become the United States, landing in modern-day Virginia. Robert Fullilove, a professor of Sociomedical Sciences at the Columbia Mailman School, and colleagues envision a series of events at the School and across the country to draw attention to this anniversary, as a way to commemorate past struggles and see a way beyond an “ecology of inequality” that continues to harm African-Americans and other marginalized groups. In a recent American Journal of Public Health editorial, Fullilove and co-authors Mindy Fullilove, a professor at the New School, and Thomas A. LaVeist, dean of the Tulane School of Public Health and Tropical Medicine, highlight several contradictions in our nation’s history, starting with the founding documents, which they write, “both challenged and embraced inequity.” The Declaration of Independence proclaimed that all men are created equal, yet the Constitution provided tacit approval for slavery. After the Civil War, the 13th Amendment banned slavery, but provided one exception, for those convicted of a crime—a loophole that sanctioned forced labor for prisoners, one part of a constellation of laws that criminalized and marginalized black people. Today, African-Americans are imprisoned at five times the rate of whites. For public health, this history is significant, as it has manifest in the form of health disparities. For example, African-Americans are three times more likely than whites to die of a pregnancy-related complication and nine times as likely to die from HIV. Other marginalized groups—ethnic minorities, immigrants, sexual minorities, incarcerated individuals, etc.—experience similar disparities that are determined by social forces. Fullilove, who has a long track record of working to illuminate and address historical injustices, has traveled to Nantes, France, since the early 2000s to raise awareness around the city’s two-century-long role in the slave trade. A Memorial to the Abolition of the Slave Trade opened in 2012, but the eventual goal of community groups in the city is the creation of a replica slave ship to serve as a museum to tour the country. 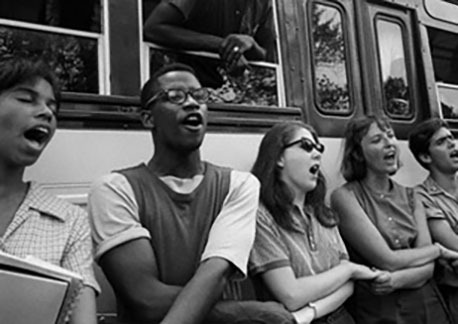 Visitors to another museum, the National Museum of African American History and Culture in Washington, DC, can find a photo of a young Fullilove taken in 1964, shortly after the disappearance of three civil rights workers, as he was about to embark on a bus trip during the Mississippi Freedom Summer. Education and outreach are critical to correcting ignorance around African-American history, the professor says. According to a new report by the Southern Poverty Leadership Council, only 8 percent of high school seniors surveyed could name slavery as the cause of the Civil War. Events to commemorate 400 years of African-American experience will begin this spring at Columbia with an April 5 workshop offered as part of Interprofessional Education Day on the Columbia Irving Medical Center campus. In the fall, the Columbia Mailman School and the University’s Office of Student Life will host an Awakening Our Democracy talk on the subject. Most commemoration events are being planned for October, timed to coincide with Indigenous People’s Day, a holiday created as an answer to Columbus Day (as many people now know, the famed explorer was an architect of a system summarized by the phrase “stolen lands worked by stolen hands”). Fullilove, who is also Associate Dean of Community and Minority Affairs, says activities could include lectures and neighborhood walks, covering topics from the biological manifestation of discrimination in the form of stress deregulation to local efforts to preserve affordable housing. Most importantly, these activities must be both community-oriented and inclusive.